The Institute was established in 1968 and has built-up excellent man power and physical facilities such as laboratories, equipments and fields with a large number of horticultural crops for post graduate research and education. During the past, the Institute has extensively participated in the post graduate education programme for the award of degrees in horticulture and other disciplines by several Universities. Since 1979, it has been recognized as a Centre of Advanced Studies in Tropical Horticulture and is playing a very important role in imparting post graduate education in horticulture leading to the award of Ph.D and M.Sc degrees. 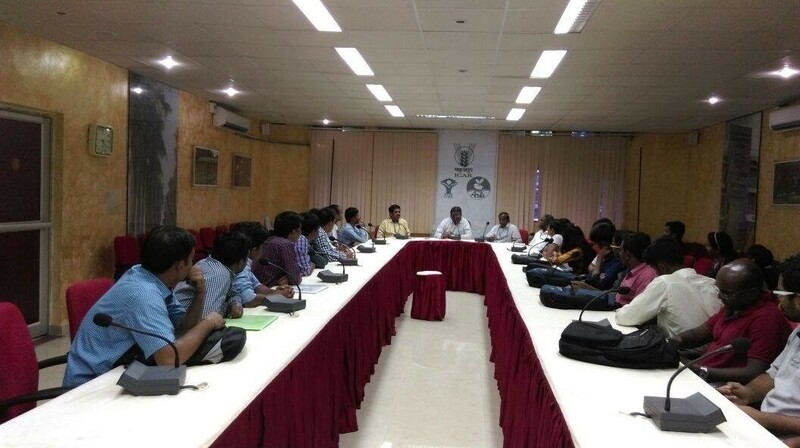 The Institute has taken advantage of the various international programme such as the UNDP by deputing its scientists to reputed Institutions abroad for study and training for its faculty improvement, which has helped in creating a cadre of competent, well trained faculty member in several aspects relevant to tropical horticulture. Several other programmes funded by NATP, DBT, ADB and UTFANET, ICAR ad-hoc schemes, etc., are currently going on in the Institute. It has also been attracting a number of trainees from countries abroad, for post-doctoral research and short term training in specific fields. All these are contributing to the development of horticultural education and research and in turn to the horticultural industry in the country as a whole. The Institute has trained and competent manpower both in the scientific and technical cadres for offering advanced post graduate courses in horticulture and for guiding post-graduate research. It has a total scientific staff strength of about 124 and technical staff strength of about 120 with adequate auxillary and supporting staff. All the scientific staff hold post graduate degrees/ doctoral degrees. Some have received training in specialized fields from reputed Institutions abroad like the University of California, University of Florida, Tropical Agricultural Institute (Wageningin), University of Hawaii, CISRO (Australia), International Atomic Energy Agency (Vienna), University of Moscow, Cornell University (Ithaca), Texas A & M University, Beltsvilee Agricultural Research Centre (Maryland), West Virginia State Univ., USA. The Institute has built up excellent physical facilities like buildings, housing purpose oriented laboratories, sophisticated equipments for specific research and experimental fields covering an area of 266 ha. with a good number of germplasm collections and long range field experiments in a number of horticultural crops. The Institute has been functioning in a spacious laboratory complex since September, 1980. The building complex consists of a main building housing Fruit, Vegetable, Ornamental, Medicinal and Aromatic Crops, Plant Physiology & Biochemistry, Economics & Statistics, Seed Science and Technology. There are separate buildings to house administration including AKMU, Divisions of Entomology & Nematology, Biotechnology, Soil Science & Agricultural Chemistry, Plant Pathology, Post Harvest Technology, Plant Genetic Resources, Extension & Trainers Training Centre, Advance Technology Information Centre building, Mushroom and Orchid laboratories, Section of Agricultural Engineering, Workshop, Library, auditorium and canteen. For field oriented research, there are several field laboratories located at different blocks of the Institute apart from glasshouses. ICAR-IIHR laboratories have been equipped with a number of sophisticated equipments to ensure meaningful execution of the research programmes. These include HPLC and GLC for hormonal studies, vapour pressure osmometer, infra red gas analyzer, leaf area meter etc., for research in crop physiology, ultra and high-speed refrigerated centrigues, GLC and Warburg apparatus for biochemistry research, GLC and HPLC for the pesticide residue laboratory, auto analyzer system, atomatic absorption spectrophotometer and ion activity meter for quick automated analysis of soil, plant and water samples, N-15 mass spectrometer and Gieger Mullar counting system for isotope work, plant water status console, pressure membrane, SAS package for advanced statistical analysis. ICAR-IIHR has MOU with reputed universities such as ICAR-IAR, New Delhi,; UAS, Bengaluru & Dharwad; UHS, Bagalkot; Sri Krishnadevaraya University, AP; Sher E-Kashmir University of Agricultural Science & Technology, UAHS, Shimoga; Gandigram Rural University, Tamil Nadu; Jain University, Bangalore, and Dr. Y.S.R. Horticultural University (Formerly APHU) for imparting higher education in the field of horticultural sciences. 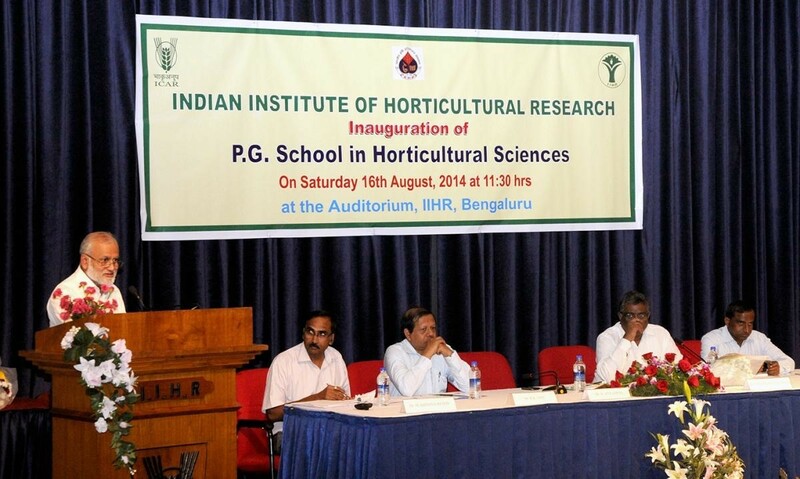 The problems faced by current day horticulture research requires multi-disciplinary research approach coupled with extended gap of available and required human resource, which calls for introduction of Ph.D programme in Horticultural Sciences at ICAR-IIHR, Bengaluru, as an out reach program of ICAR-IARI, New Delhi. DG, ICAR inaugurates the Post Graduate School in Horticultural Sciences at IIHR, Bengaluru: Dr. S. Ayyappan, Hon'ble Secretary, DARE, Government of India and Director General, ICAR, New Delhi inaugurated the Post Graduate School of Horticultural Sciences, at Indian Institute of Horticultural Research, Bengaluru, on August 16, 2014. Dr. N. K. Krishna Kumar, Deputy Director General (Hort. Sci. ), ICAR, New Delhi and Dr. R. K. Jain, Dean and joint Director, ICAR-IARI, New Delhi were also present as Special Guests on the occasion. Dr T. Manjunatha Rao, Director (Acting), ICAR-IIHR, Bangalore welcomed all the dignitaries. 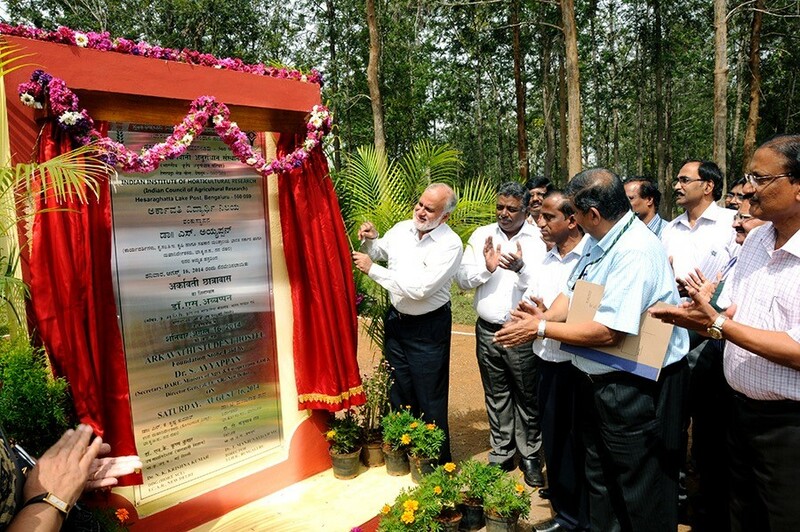 Dr. S. Ayyappan inaugurated the Post Graduate School by lighting the lamp and in the inaugural address, he remarked that the Indian Institute of Horticultural Research, Bengaluru has all the expertise in terms of human resources and advanced infrastructure facilities for conducting research and pursuing higher studies in horticultural sciences in the country. He called upon the students to make best use of these expertise and facilities to excel in their research studies. Dr N. K. Krishna Kumar, DDG(Hort. Sci.,) in his remarks underlined the efforts made by the earlier DDGs and Directors in accomplishing the PG education programme at ICAR-IIHR and explained the genesis of PG school. 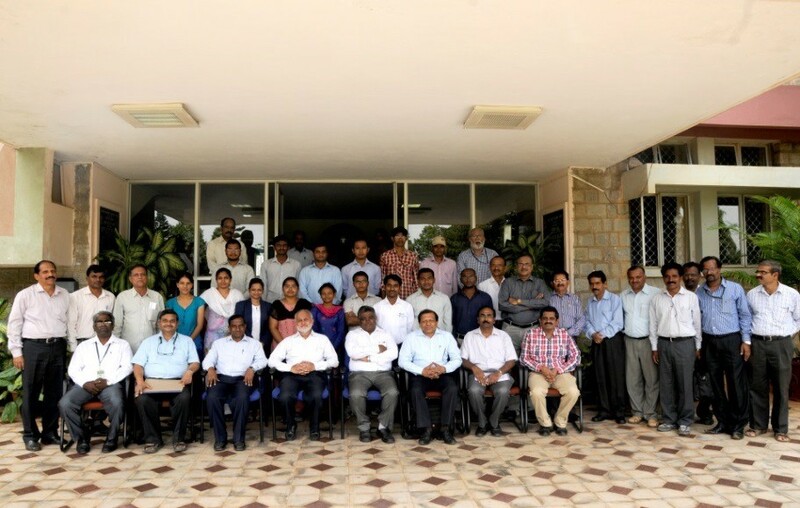 Vice Chancellor of UAS, Bangalore, Directors and Heads of ICAR Institutes/Regional Stations situated in Bengaluru, former Directors, HODs and scientists of IIHR, all the staff of ICAR-IIHR, and the students of Ph. D programme attended the function. Dr S. Ayyappan also laid the Foundation Stone for the “Arkavathi Student Hostel”. The Post Graduate School of Horticultural Sciences presently offering Ph. D program in the disciplines of Fruit Science, Vegetable Science, Floriculture & Landscape Architecture and Post Harvest Technology, as an out reach program of ICAR-IARI, New Delhi. During the first academic year (2014-15), 16 students (three in Fruit & Horticulture Technology, six in Vegetable Science and seven in Floriculture & Landscape Architecture) were admitted to pursue Ph. D degree program. During the I academic session, ICAR-IIHR have successfully offered 27 courses in Horticulture and allied disciplines like Biotechnology, Genetics, Plant Physiology, Pathology and five compulsory courses in Statistics, Extension and in IPR. The second batch of ICAR-IIHR commenced on 08.08.2015 with a total 16 students (three in Fruit & Horticulture Technology, six in Vegetable Science, four in PHT and three in Floriculture & Landscape Architecture) were admitted to pursue Ph. D degree program, as an out reach program of ICAR-IARI, New Delhi. 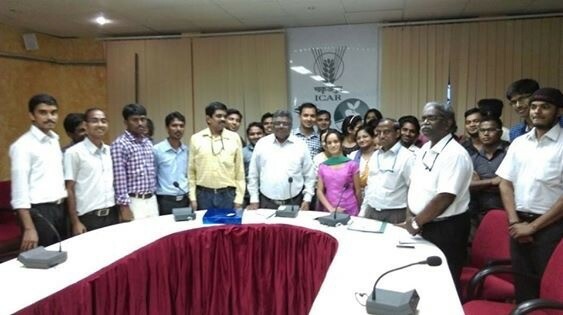 Dr N. K. Krishna Kumar, Deputy Director General (Horticultural Science) welcomed the II batch of ICAR-IIHR students admitted to pursue Ph.D (Horticulture) and Ph.D( Post Harvest Technology), as an ICAR-IARI outreach program on 10th August,2015. While addressing both I & II year students, he called upon the students to undertake cutting-edge research in key areas of horticulture crops. He advised the students to articulate themselves in various areas of research by making use of the best available resources and faculties at ICAR-IIHR. During the inaugural year, 92 ICAR-IIHR scientists across various disciplines and 22 scientists in Horticulture were recognized by ICAR-IARI as faculty to impart teaching and guide students in their research, respectively. For effective monitoring of Post Graduate activities, Board of Studies was put into place by including a student’s representative and ICAR-IARI on-line PG school management system was extensively adopted. The PG program is in-house and all the basic facilities required for the students such as hostel, classroom, library, playground, recreation facilities etc. have been created at the Institute campus itself.